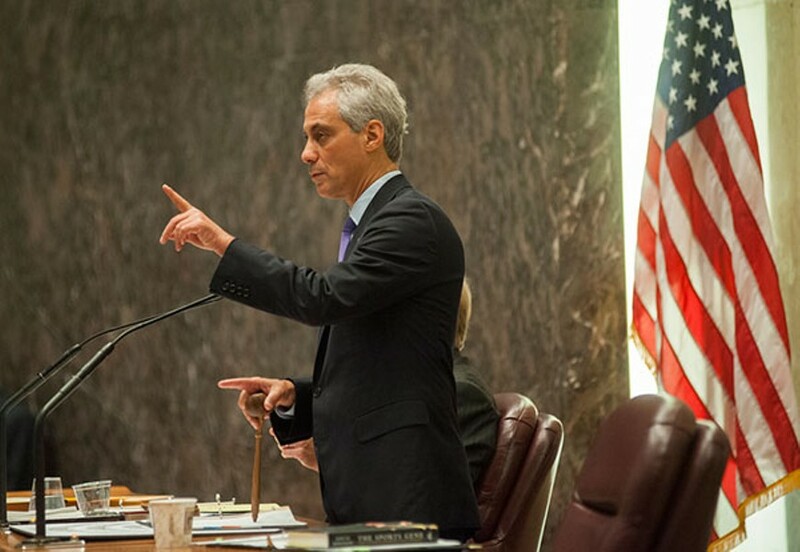 Michael R. Schmidt/Sun-Times Media Mayor Rahm Emanuel addresses the Chicago City Council July 24. The council's vote that day was the first and probably last chance to stop the South Loop basketball arena project. 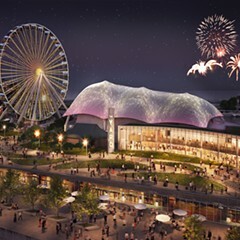 Last week I led a tour of the site of the $800-or-so-million boondoggle Mayor Emanuel's earmarked for the South Loop. 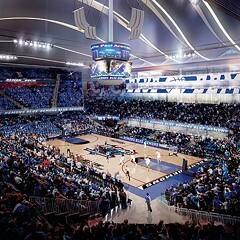 You probably know it as the DePaul basketball arena project, the popular shorthand. Sorry, Mr. Mayor—I haven't forgotten this baby, even amid the distracting hullabaloo over the start of the new school year. In fact, I'm thinking of giving regular tours to parents, students, teachers, and principals. They might as well see where their money's being wasted. This time I took Dave Glowacz, my podcast partner, which meant we rode our bikes—the bicycle being Glowacz's favorite mode of transportation. We started on Michigan and Cermak, a location that gives you a splendid view of the storefronts (along the intersection's southeast corner) that will be demolished. The mayor says it will cost at least $55 million to buy land for this project and the money will come from the tax increment financing program, intended to eradicate blight in poor neighborhoods. This block is as close to blight as you'll find around this neighborhood. The buildings across the street look like they could use a coat or two of paint, and a few windows are boarded up. In its promotional material for the project, the city depicts this area as a slum. What the city doesn't show you is that just down the street to the east and south are dozens of high-rises and townhouses that have been built over the last ten or so years—without any TIF handouts. Overall, the South Loop's undergone a decade of boom, halted only by the recent recession. Now that land prices are starting to rise, Mayor Emanuel's diving into the south-side real estate market with your tax dollars. His timing couldn't be worse. The mayor's proposing to use this block as the site of a 1,200-room hotel, which means all the existing businesses have got to go. Dave and I walked into Windy City Furniture, at 2221 S. Michigan, a large used-furniture show house. Behind the counter sat Michael Cooper, whose great-grandfather started the business near Maxwell Street almost 90 years ago. 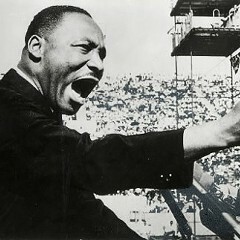 Yes, he said, the city contacted them to buy their property. And no, they don't want to sell—but what choice do they have? "You can't fight City Hall," he said with a smile. He shook his head at the irony of the project. In time, rising real estate prices might tempt his family to sell their property anyway. So the mayor's hastening the inevitable, and using millions of dollars of property taxes to do it. After leaving the furniture store, we headed one block east to Indiana Avenue, and stood before a lot owned by James McHugh, a well-connected contractor and developer. For the last few years, McHugh's planned to build a data storage center here; a sign on his property still notifies passersby of the project's website. But on July 24, the City Council voted to give the mayor eminent domain authority to take McHugh's land. Once he gets approval from a judge, the mayor can seize the property and start building his hotel, while still haggling with McHugh over a sales price. That July 24 vote was the council's first and probably last chance to stop the project—it will be tough to vote against it once they've got McHugh's property. 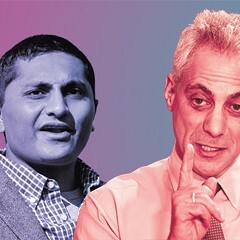 Yet the council unanimously approved the acquisition authority—on a voice vote that Mayor Emanuel gaveled through so quickly there was no time for any aldermen to object, much less discuss. So much for due deliberation. If the city had let McHugh build his data center, he'd be paying property taxes that would support the schools. Instead, the mayor will be taking property tax dollars from the schools to buy McHugh's land. Of course, city-owned property pays no property taxes. So the mayor's spending money to lose money. And you wonder why our schools can't afford art teachers. Across Cermak to the north is the Lakeside Bank, owned by Victor Cacciatore Sr. The Metropolitan Pier and Exposition Authority—a joint state-city entity—has sued to seize that property. Just east of the bank is a parking garage owned by CenterPoint Properties. Metropolitan Pier has also sued to take that property. CenterPoint had been considering other development deals for their land, but the efforts of Metropolitan Pier put an end to them. Even though it's the joint entity filing the lawsuits, city TIF money will be used to buy these properties. So your property taxes will have to compensate for the money we're losing here. Just so you know. 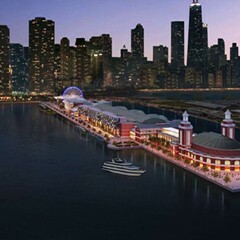 On the CenterPoint/Lakeside block, the city and Metropolitan Pier will team up to build a second, smaller hotel and an arena that DePaul's basketball team will use. The arena will also host concerts and sporting events, the mayor says. All told, the city and state say it'll cost about $840 million to develop this project—of which $70 million will come from DePaul. The idea is that between the two hotels and the basketball arena the city will turn this corner of town into a honky-tonk for McCormick Place conventioneers. I guess Rush Street's not good enough for them. Metropolitan Pier claims the big hotel alone will create "500 permanent full-time jobs." What they don't tell you is that the mayor recently fired some 3,000 public school employees—including about 1,500 teachers—because the system's broke. If they stick around long enough, public school teachers can make close to $100,000. Plus, residency requirements force them to live in Chicago, where they—and police and firefighters—form the backbone of the middle class. Essentially, the mayor's using the money he "saved" by firing teachers to create lower-paid hotel jobs. Killing middle-class jobs to clear the way for lower-paying jobs—someone should tell President Obama what his old chief of staff is up to. Here's another interesting irony. CenterPoint is owned by the California Public Employees' Retirement System—or CalPERS. As the name suggests, it's a pension fund for public employees, teachers included. So the mayor's proposing to take millions from Chicago's public school teachers and use it to pay a public school teachers' pension fund in California not to develop its South Loop property. It's nice that some teachers might benefit from this boondoggle. Too bad you have to cross the country to find them. We conclude our tour at the corner of Prairie and 21st, where we find a man taking pictures of an old house. It's the Rees House—one of the oldest in Chicago—and the man's Paul Hohmann, an architect from Saint Louis, who's touring the city's architectural sights. I tell Hohmann that the Rees House—a city landmark—sits on land the mayor wants to use for the arena. So the city is planning to move it to another location. "But that means the city will have to buy other property somewhere around here," he says. Welcome to Chicago—where we always find new and innovative ways to waste money. So there you go. The project promises to kill jobs, raise taxes, and make our schools even broker than they already are. See you on the next tour. While the plan for independent analysis stalls, the City Council approves spending $55 million on the mayor's hotel and stadium deal.